Home » advertisements , bioshock , bioshock 2 , video games , viral marketing » BIOSHOCK 2 marketing hits the beaches! BIOSHOCK 2 marketing hits the beaches! BioShock 2 may have been pushed back to next year but that's not keeping 2K's PR team from going to some extraordinary lengths of viral marketing for the much-anticipated game. This past week a mysterious note appeared on the game's teaser site listing numerous beaches around the world and a time to be there... which was yesterday morning. This was the scene at Australia's Bondi Beach, where BioShock fans found dozens of wine bottles (from Arcadia itself) washed up on the shore. 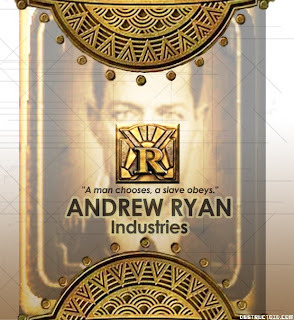 Within each bottle was one of several posters from Rapture, including this advertisement for Andrew Ryan Industries. Kotaku has photos of more discoveries. And wouldn't you know it, but the Rapture wine bottles are already fetching a pretty price on eBay. BioShock 2 is due sometime next year. Hopefully sooner than later. According to Gametrailers.com, if you pre-order the game through GameStop you'll get two exclusive multiplayer characters, Blanche The Actress, and Zigo The Fisherman.